Rather a lot of progress, accomplished through the simple expediency of spending money. 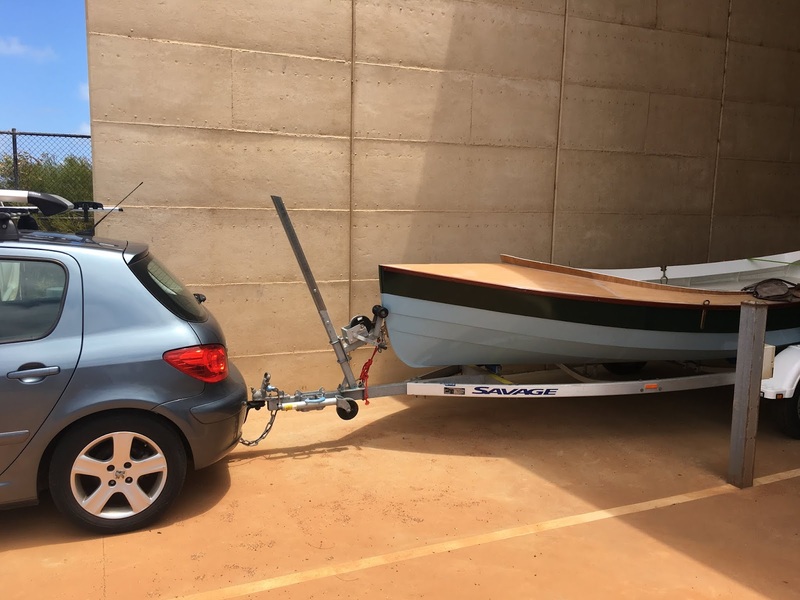 This was necessary because we're moving to Perth in the next couple of months, so the boat must now be mobile. Looks rather nice on a trailer, I reckon. The Applix 1616 was a very cool 32 bit computer designed in Australia in 1985 by Andrew Morton. It used the Motorola 68000 (like a Macintosh!) 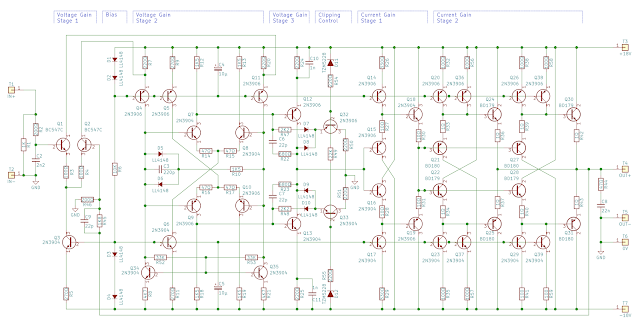 and had a fully bit-mapped display. All very cool stuff. Many people (myself included) see the Applix as something of a successor to the Microbee, though minus the commercial success of the 'bee. 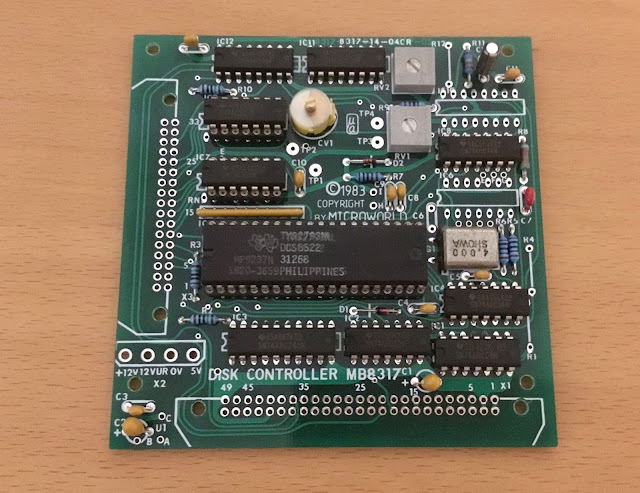 Incidentally Microbee designed their own 68K machine (the Microbee Gamma) not long after the Applix became available, but struggled badly in development. The Gamma was never released publicly, and only a handful of prototypes exist now. 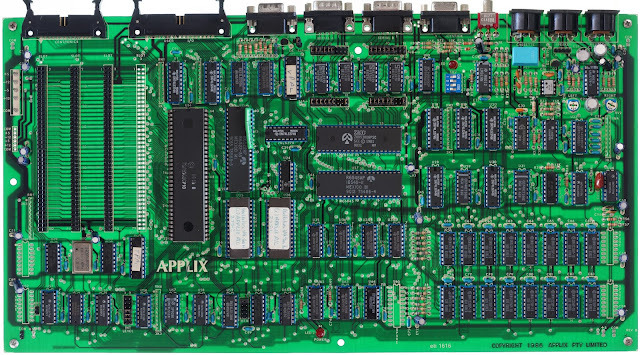 There were kits of the Applix available, and a blurb in ETI magazine, but things like 68K processors were obscenely expensive back then, so there was no way I was going to build one. That's all different now. 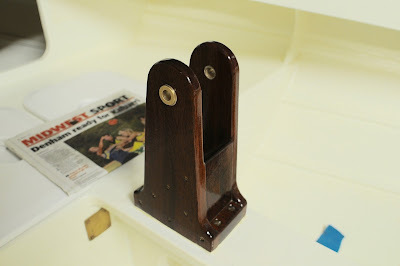 I've got pretty-much all the bits in my various junk boxes and drawers to make one. Now all I've gotta do is reverse engineer the PCB layout, come up with some PAL designs, and go for it. Unlike the bee there are no issues with IP ownership and sharing. There are four sheets - CPU, CRTC, and a couple of I/O ones. How hard can it be? I've managed to borrow a real Applix 1616 (Thanks heaps Philip), which after a quick clean I've taken some really detailed macro photos of to help with the replication. In each case I've put a real 2SJ162 next to the fake. In all photos the fake is on the left and the real deal is on the right. 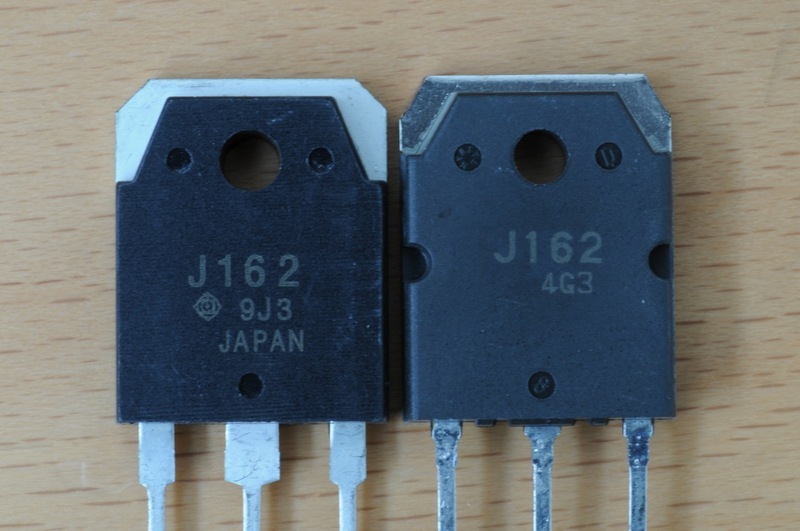 The real transistor is the most modern version of the 2SJ162, made after Hitachi spun their semiconductor foundry off as it's own entity under the "Renesas" brand. 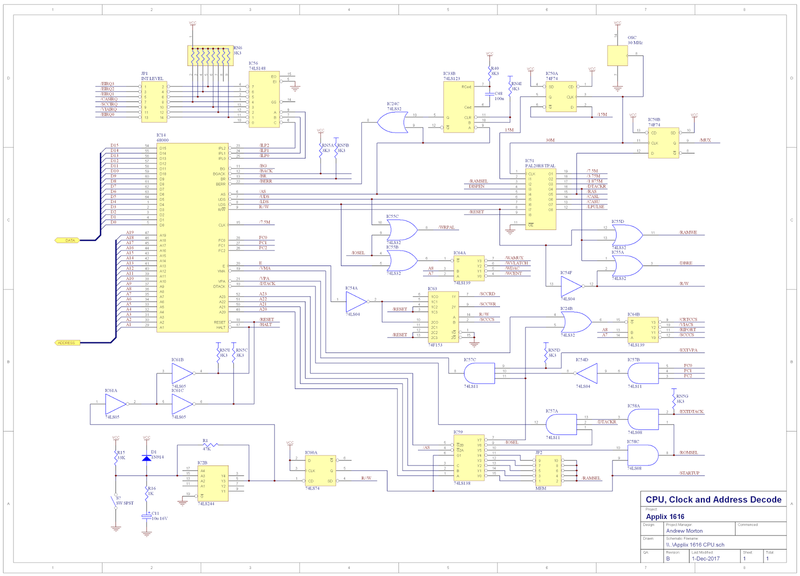 Note the absence of Hitachi markings, or indeed Renesas. Note also that the real thing has it's marking done with a printing process, whereas the fake has markings done by laser, in a raster pattern. Lots of transistors are marked by laser now - indeed it's the standard way for product to be identified these last fifteen years or so. However that's after Hitachi became Renesas. 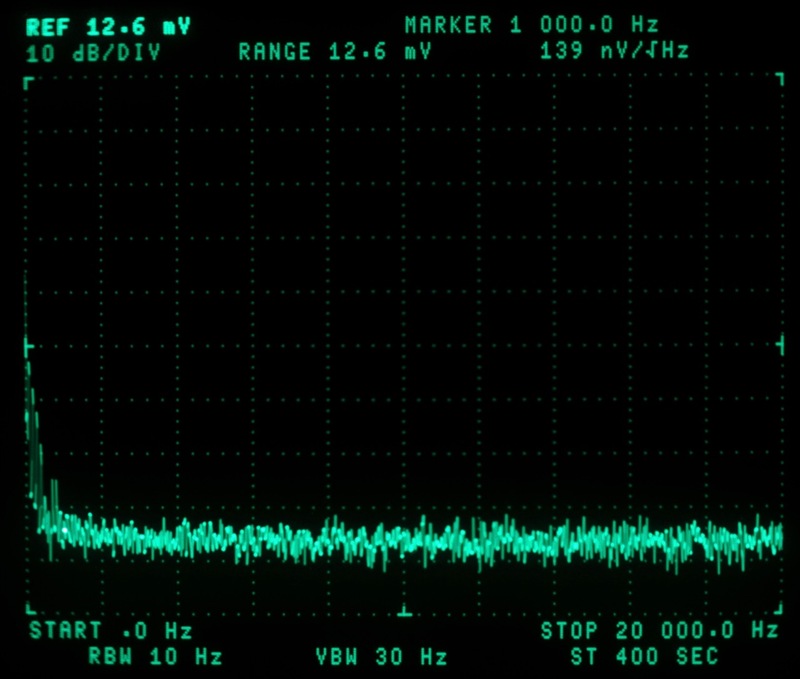 Note the real Renesas product (perhaps twelve years old) still hasn't got laser markings. The other tell-tale is that the date code on the two wildly different 2SJ162 packages is identical. Fabs do change their packaging from time to time, but not with the same date code. Note further that the raster pattern isn't just where the markings are, but extends all the way across the package. I'm hypothesising that this is how they obliterate the original markings without resorting to sanding. Again, real deal on the right, fakes on the left. Same thing with the laser markings, but this time the raster pattern is only where the text is. 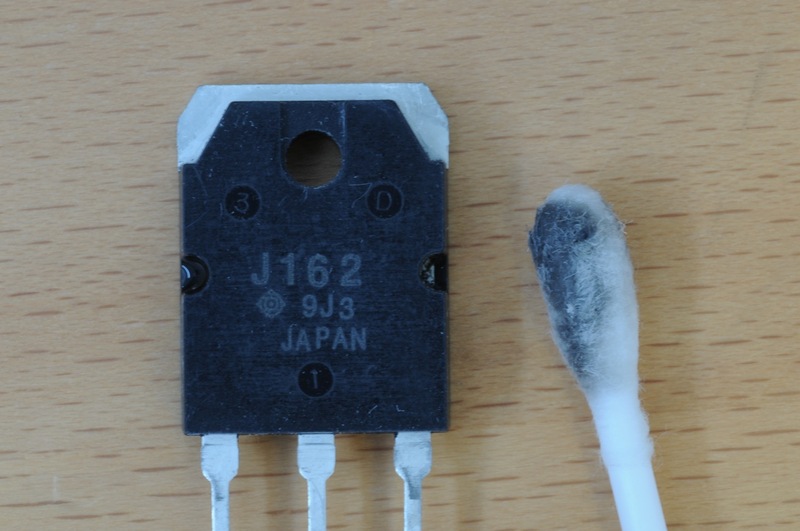 Perhaps they got a pile of transistors that were unmarked so there was no erasing needed? This is incredibly frustrating. 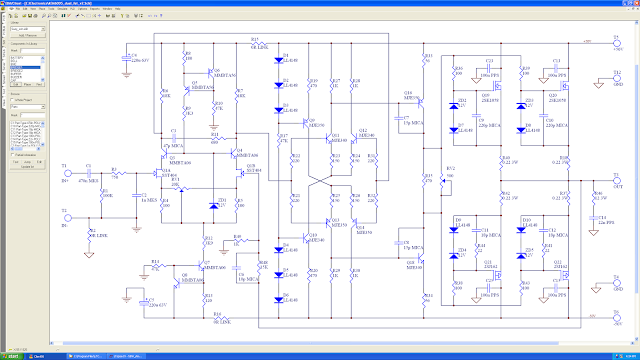 I'm a seasoned professional engineer with decades of experience. 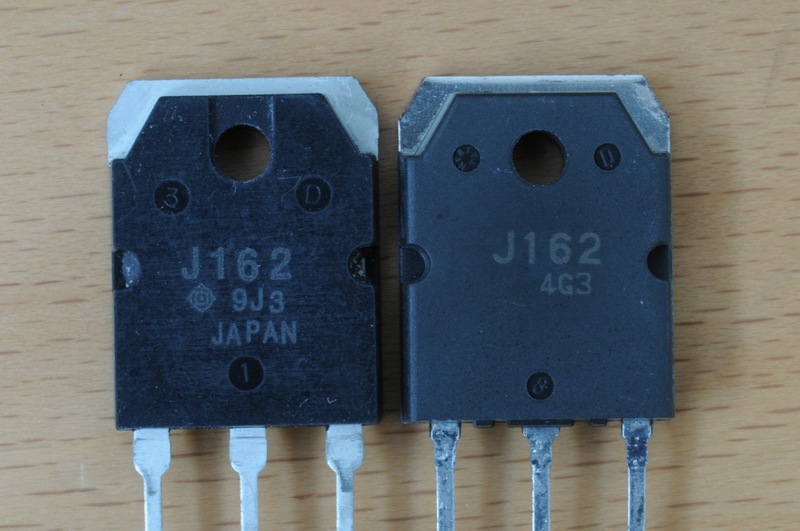 If I didn't have some known-good stock of these transistors, and if I hadn't been alerted to the possibility of trouble by the two different 2SJ162s with the same date code, then I'd have chucked them in a circuit and wondered why it didn't work. How's a fifteen year old enthusiastic kid going to cope? 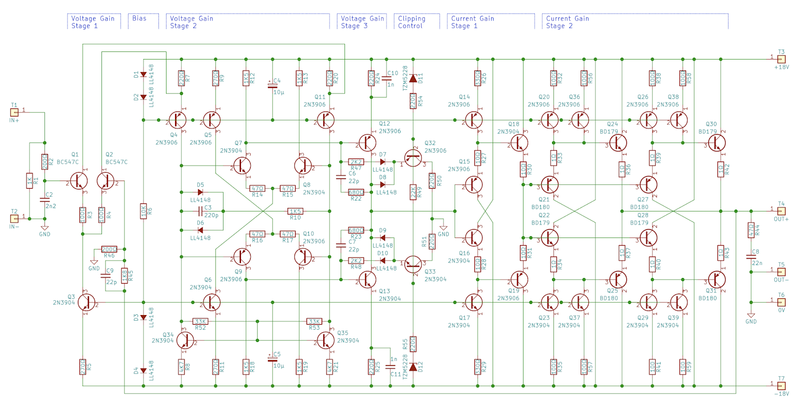 She'll build her amp, wonder why it vanishes in a cloud of smoke, and give up. A very easy test can be done with a multimeter. 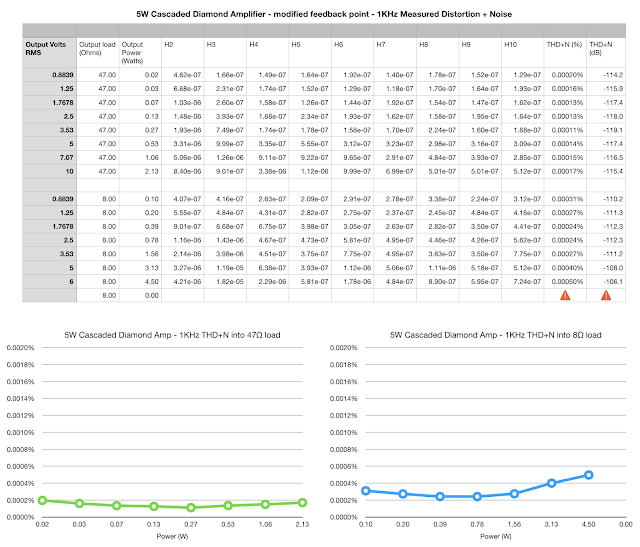 Cgs on the real parts is ~0.8nF, and Cgd around 0.6nF for the 1058, and 1.1nF for the 162. 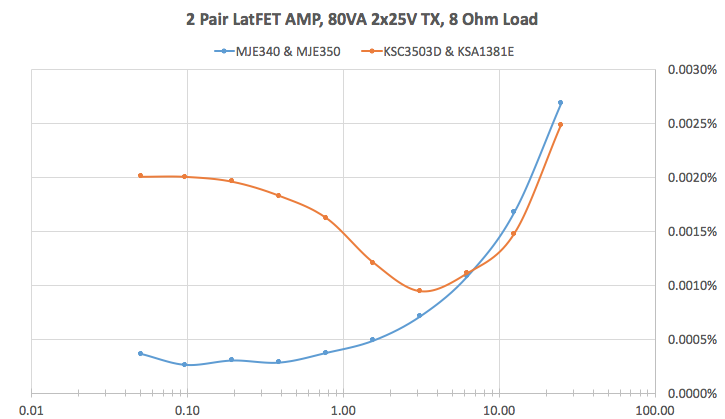 For the fakes I didn't measure valid capacitances for most of the 2SJ162s (so they probably aren't even MOSFETs), and the remainder all measured ~5nF Cgd, so they're likely DMOS parts rather than lateral MOSFETs. Black scunge comes off, and the raster pattern is more obvious. 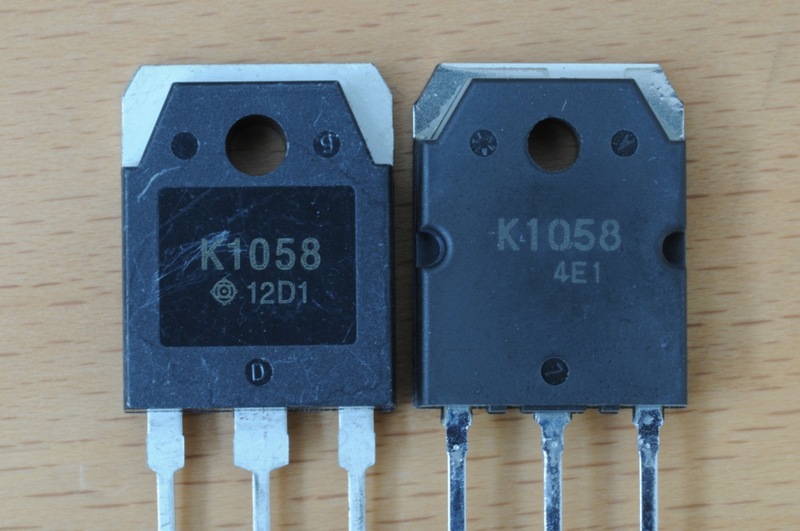 I'm wondering if they paint the transistors with something where they've had to remove markings to blacken them up before remarking. I didn't get any black scunge off the "2SK1058" variety - I'm thinking this is because no remarking was needed for these ones. 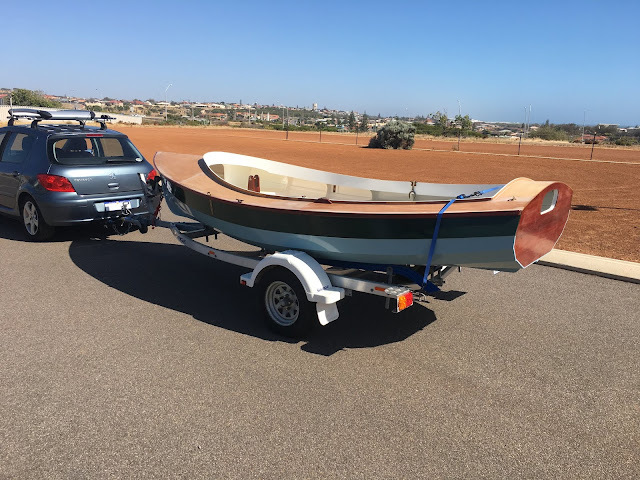 I'll see how the seller goes with a refund. Edit: The seller refunded immediately, and said "Hello I sold many of this item, without any complaint", which is I guess exactly my concern. So lots of people have bought these, put them into amps, found they don't work, then blamed either their own assembly skills or else the amp design, when the problem is that the actual parts are fakes. It's really unconscionable behaviour. 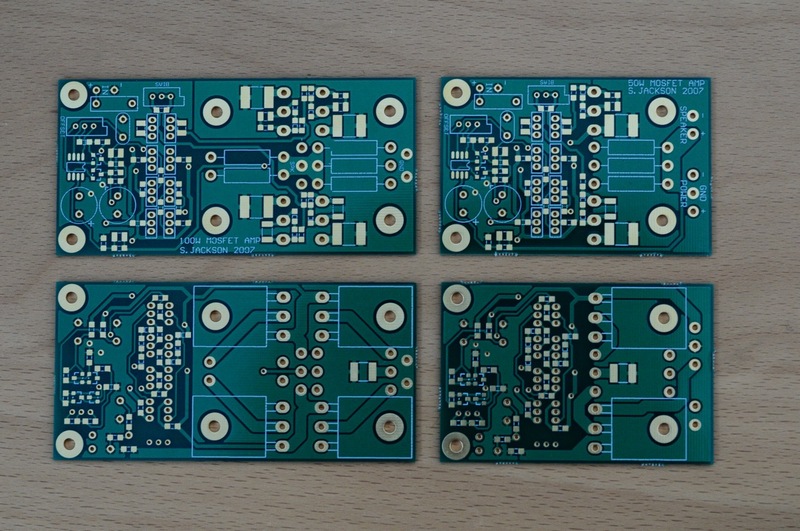 The dies are all different sizes - 4.2mm square for the first "2SJ162", 4.1mm for the second, and 4.5 for the "2SK1058". 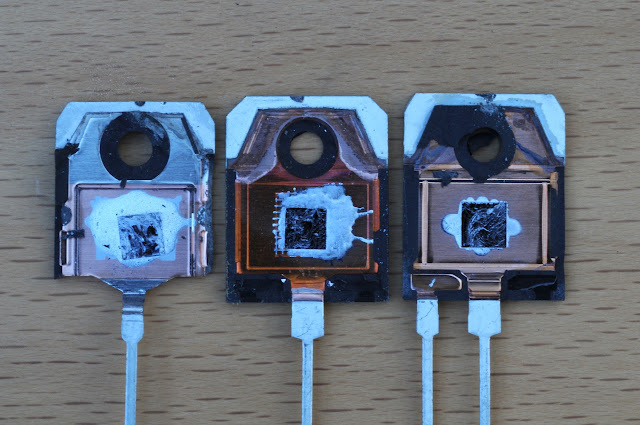 They made rather a mess mounting the die, which is a little surprising and makes me wonder if perhaps these are specifically built to be fakes - ie that they buy die and package them, then put bogus labels on them. 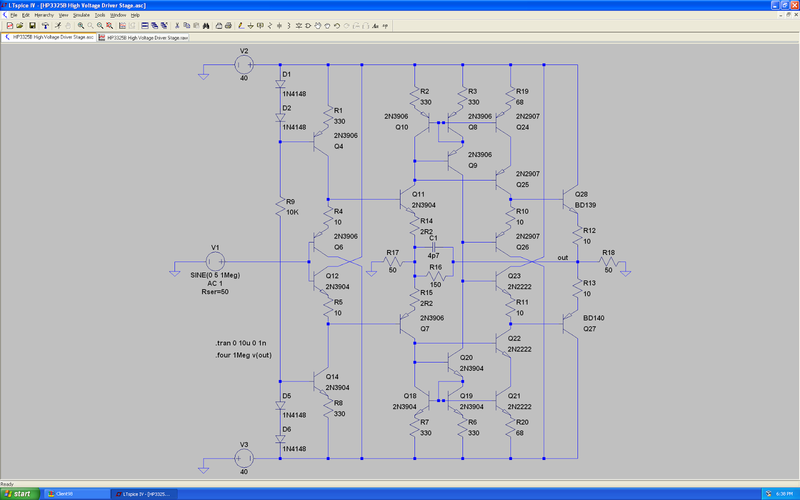 Measuring a MOSFET Power Amplifier. I'm on a bit of an audio kick of late. 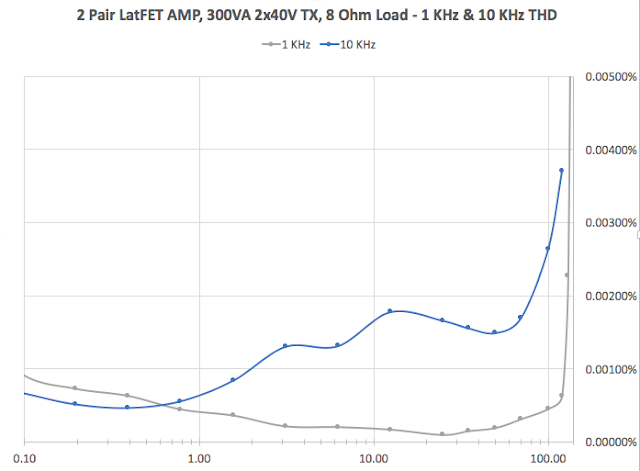 It's all about building some speakers and an amp for my study, as I stole the speakers and amp from there (some nice home-brew 2-way bookshelfs with Vifa P13WH mid-woofers and P27TG tweeters, and an old NAD 3020B) for my bedroom. 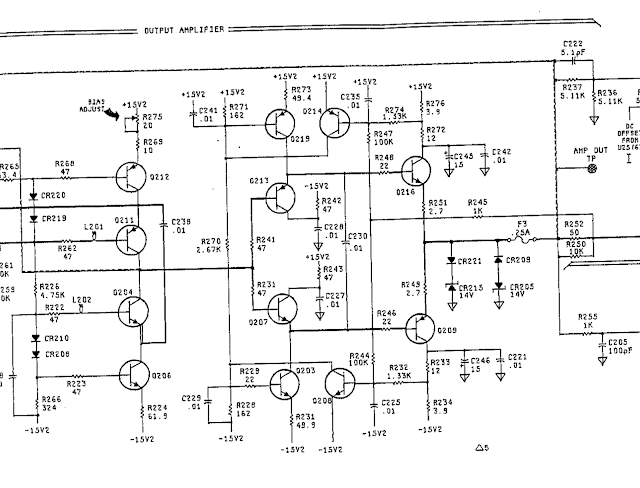 Anyway, I've got a pre-existing amp design, based on David Tilbrook's AEM6000, and I've ordered the drivers to build a pair of Lynn Olsen "Ariel" MTM transmission lines. That'll make some pleasant noise, I think. On to the amps. 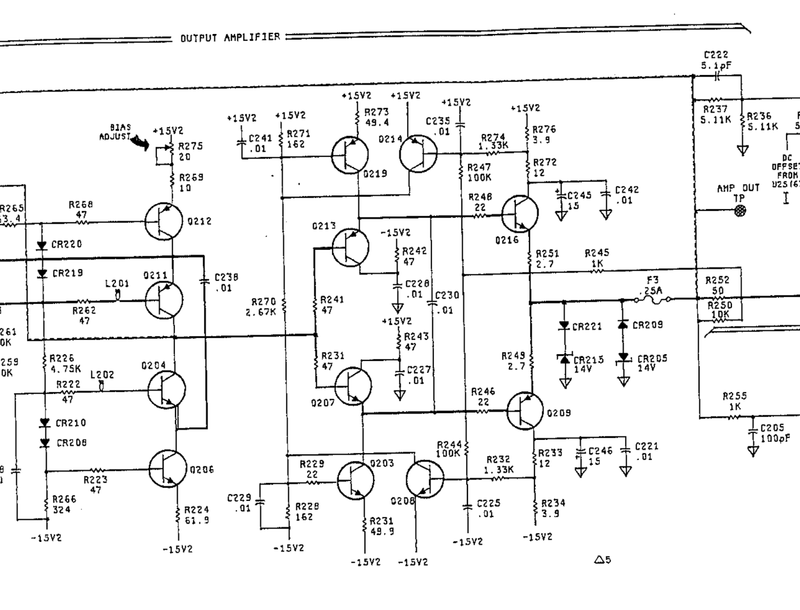 Back when I originally designed these amps, some 10 years ago, the distortion analyser I had had a noise floor of 0.0013%. I achieved that fairly easily so moved on. 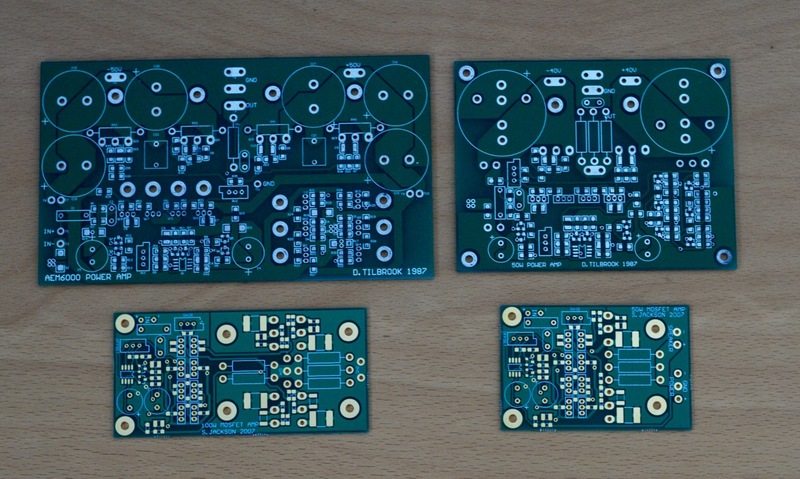 I've just bought a PCB for a super-low distortion oscillator based on the Linear Tech "AN67" circuit, which uses some scary high-gain opamps wrapped around a resonator to generate an "unmeasurably" pure tone. Now I've got a sniff of a world beyond 0.001%, I'm very keen to see how far I can go. Part of that's developing a whole new completely over-the-top amplifier (see previous posts), part of that is just playing with my existing amps to see what they're really capable of. The process is straightforward. 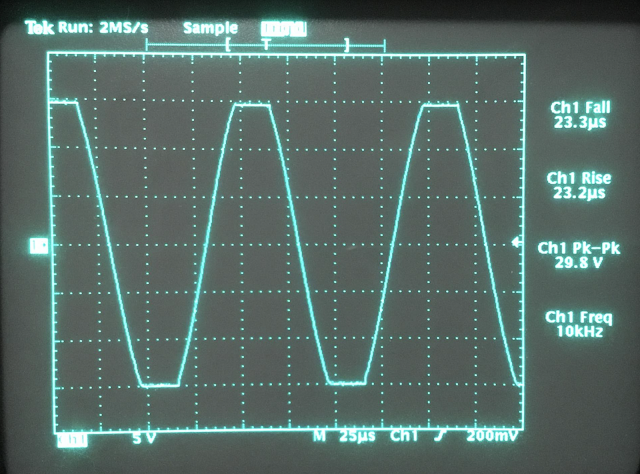 Put one together on a heatsink with a dummy load and thrown together power supply using bits from the garage, apply a stimulus from either my mac, my function generator, or my new oscillator, measure what's being put into the load with my CRO and spectrum analyser, tweak, repeat. 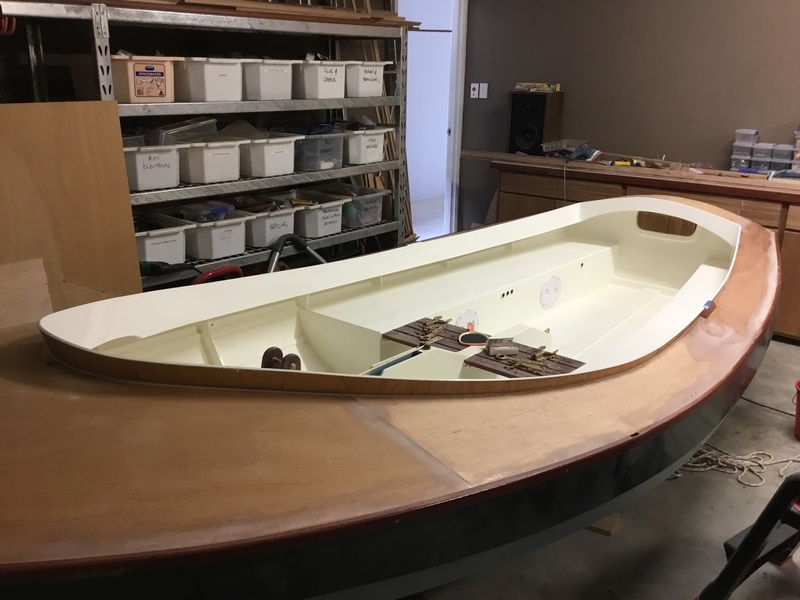 It's a process that's quite involving. 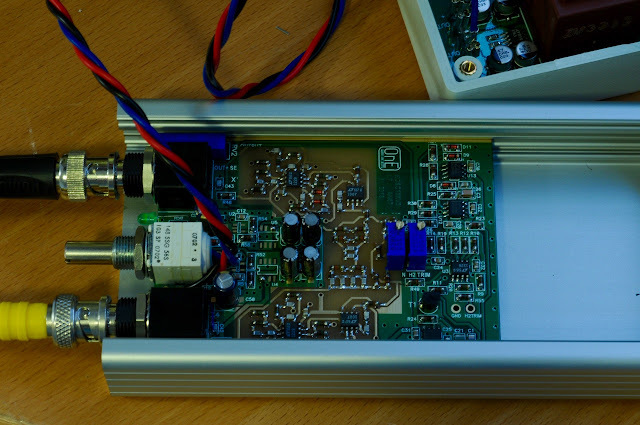 They started with my original "repackaging" of the AEM6000 using flat-pack MOSFETs, shown on the top left. Then I made a "baby" 50W version (top right). 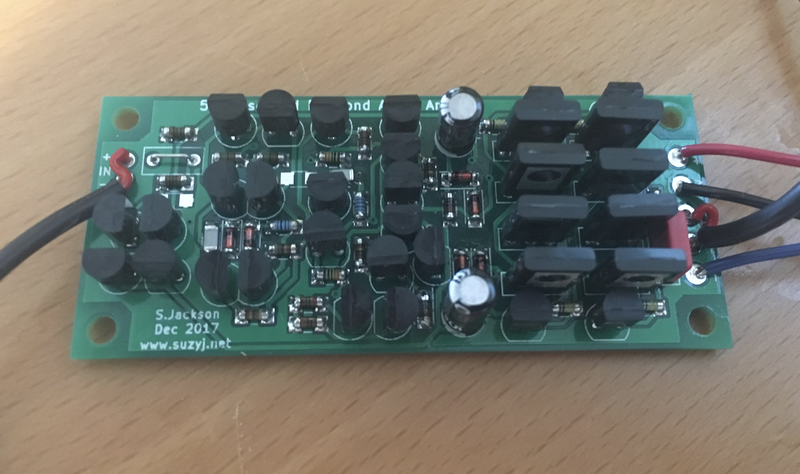 While making that I wondered whether I could roll a version that would fit on a 50mm wide heatsink, with off-board filter caps. That resulted in the two smaller boards below. They depart from the original in that the VAS stage is no longer differential-symmetrical, as I simply couldn't see the advantage of the differential structure in Tilbrook's original. Also I made much better use of the back-side of the PCB. 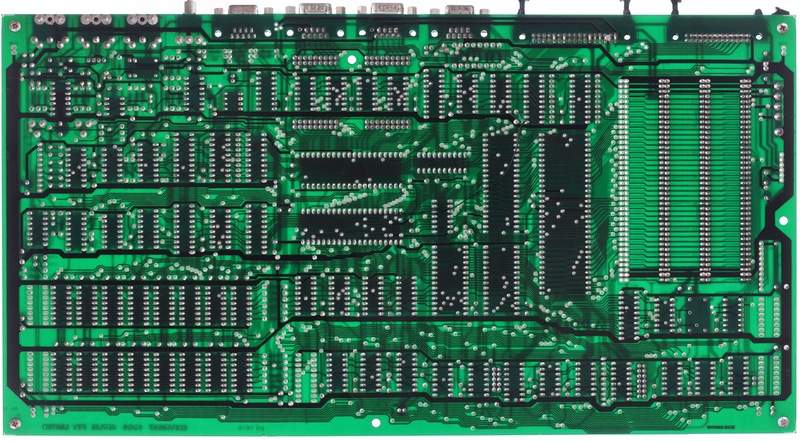 Whereas the original has practically nothing on the back bar the MOSFETs, this one has a fairly even spread of parts on each side. 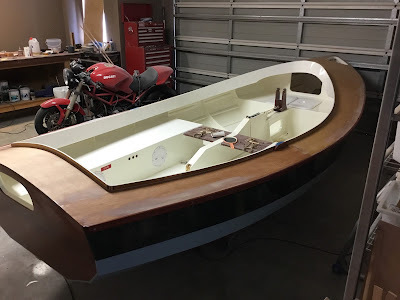 That makes it more compact and keeps parasitics down. Despite the small size it's still using 1206 (or MELF 0204) parts. No nasty surprises. 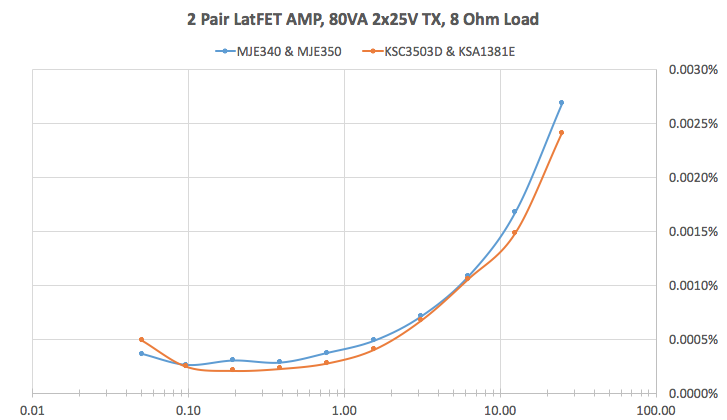 Hitachi lateral MOSFETs are prone to oscillate around 1-2 MHz if the amp isn't well compensated. 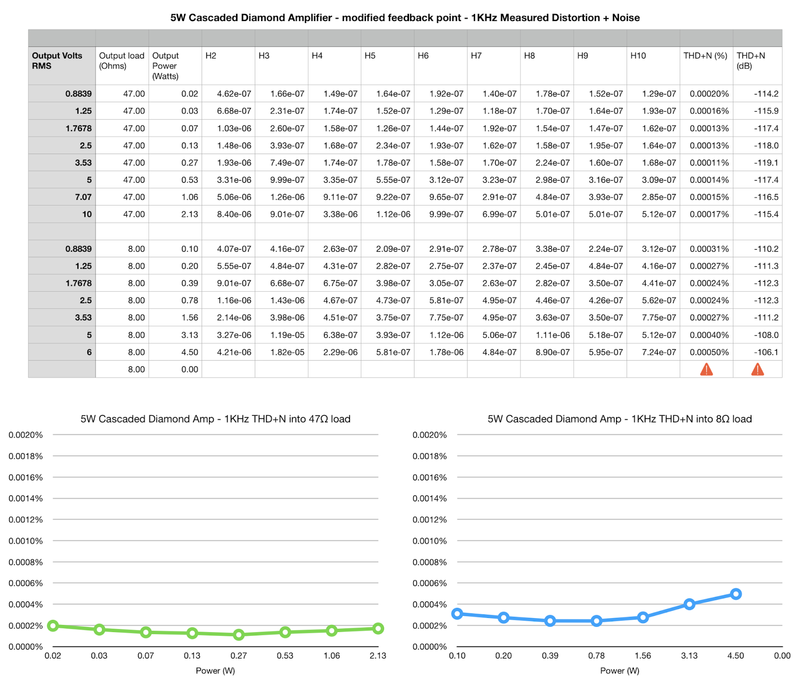 I find working with LTspice to prototype the compensation is straightforward, and as long as you check the DC conditions on the real thing you'll be good. 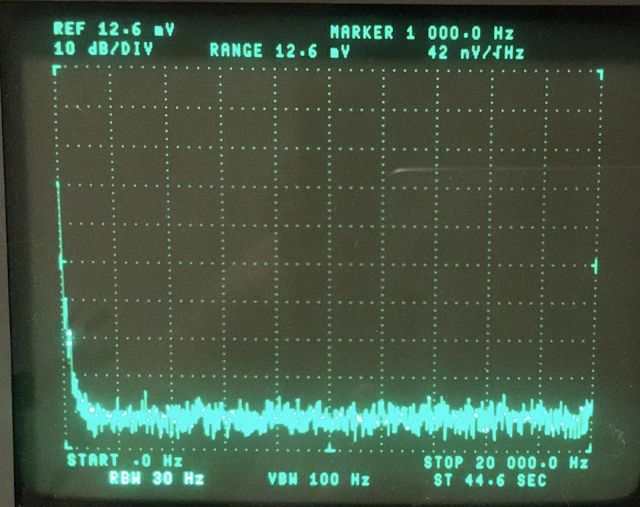 It's hard to tell the spectrum analyser from my amp at the bottom end, as the spectrum analyser has a high-pass at 20Hz. 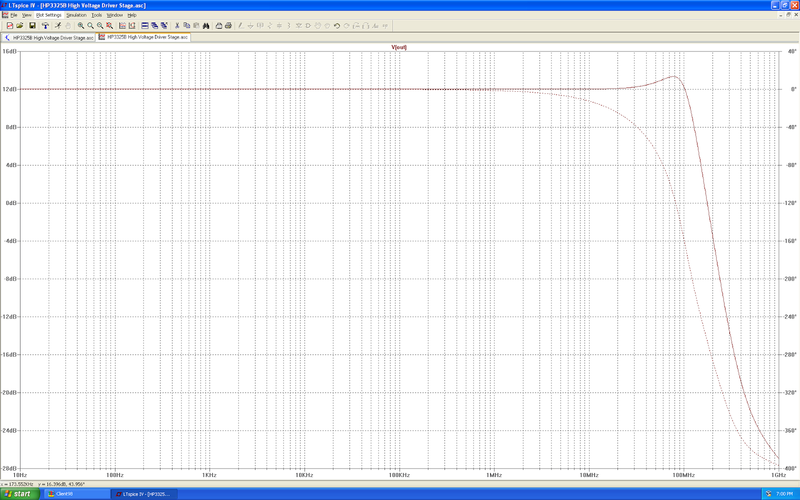 Anyway, it's flat to within 0.1dB or so from there to 20KHz, which should be plenty. 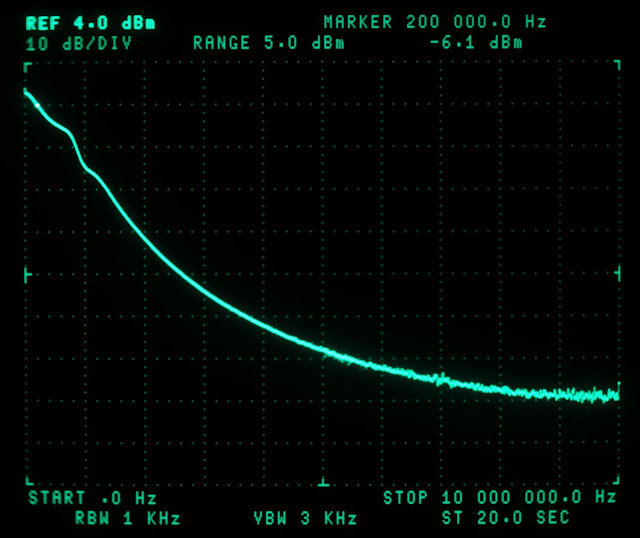 Of note is that I measured my NAD3020B, and it's got 6dB of bass boost from 60Hz to about 500Hz, with the bass knob in the middle. 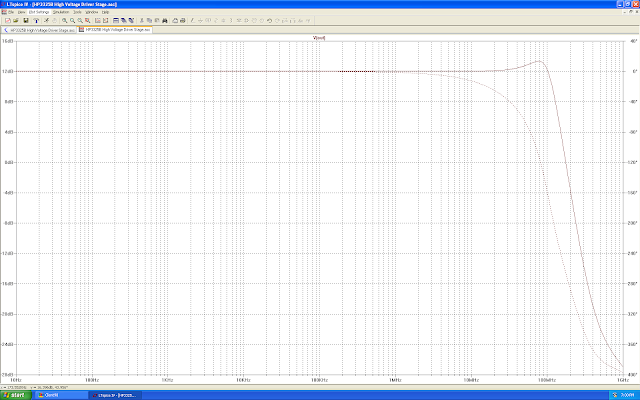 It's relatively flat when the bass knob is turned all the way down. I guess that's how you sell amps. That one "sounds better" - ie colours the music. 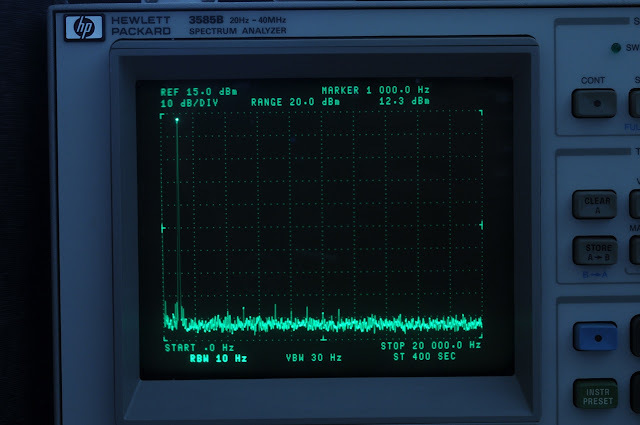 With the marker at 1KHz, we read off 139nV/sqrtHz. 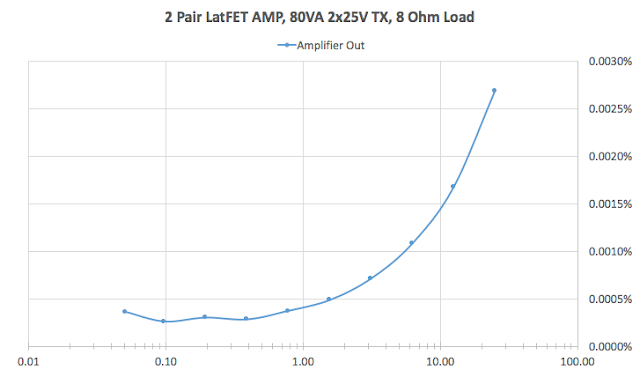 Input referred (this amp has a gain of 16), that's just 8.7nV/sqrtHz. To put it into context, the OP134, a pretty well regarded low-noise opamp, has an input referred voltage noise density of 8nV/sqrtHz. Okay, not bad. 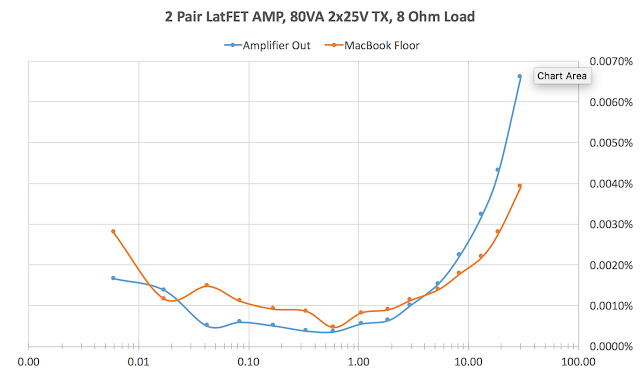 Note the amp appears better than the macBook around 100mW to 1W. This is simply because the amp provides a gain of 16, so what was buried in the noise of the spec-an without the amp, isn't with the amp. Things turn to custard after a few watts. 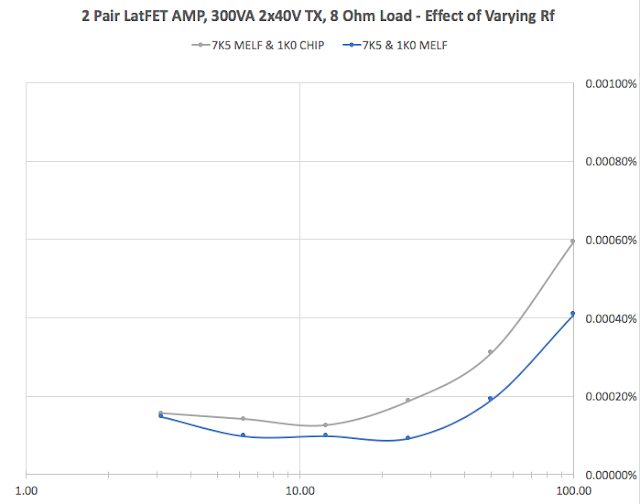 Initially I passed that off on the wimpy 2x25V 80VA supply I was using for test, but we'll find later it's a much cooler problem. 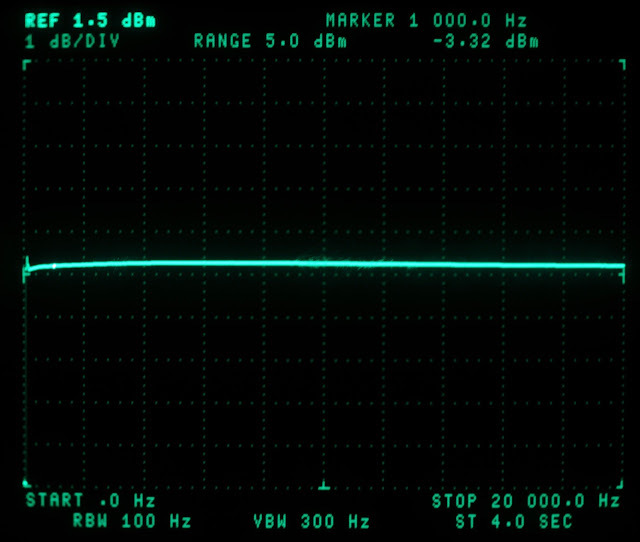 But the distortion still isn't anything to write home about - sure, it's better than 0.001% at medium levels, but it falls off badly after a few watts. 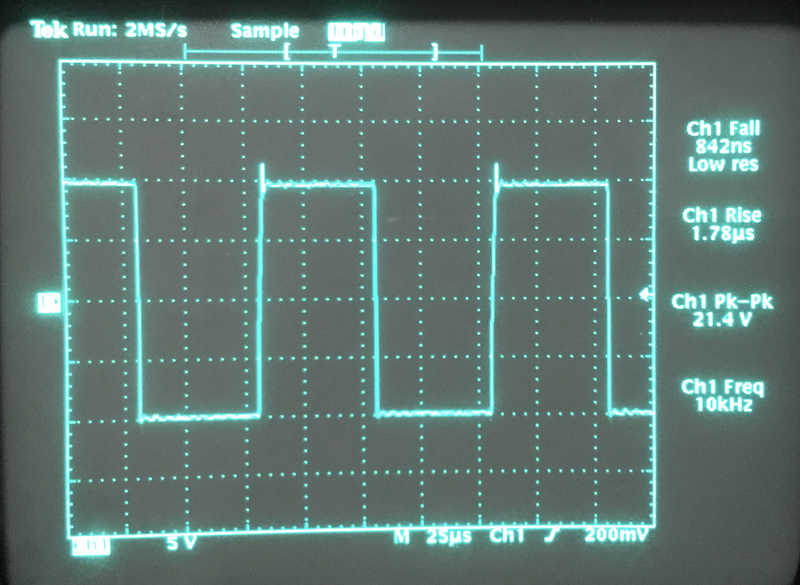 I'm sprucing up my HP3325B, after it stopped working (shorted out tantalum). 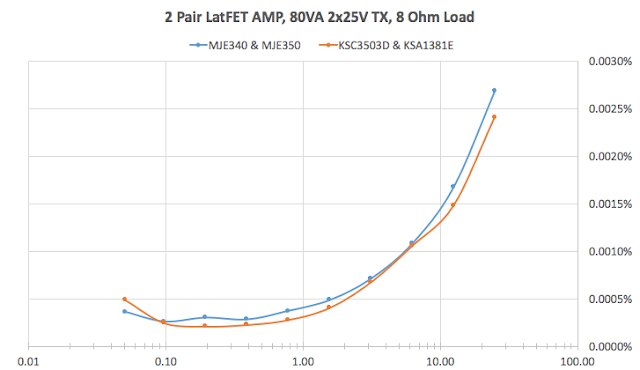 One of the options for the HP3325B is the "high voltage" output, which allows up to 40Vpk-pk, at up to 1 MHz, into 500 Ohms. Usual output is 10Vpk-pk, at up to 21 MHz into 50 Ohms. Anyway, I don't have that. I was wondering if I could perhaps build a buffer-amp that beats their spec. 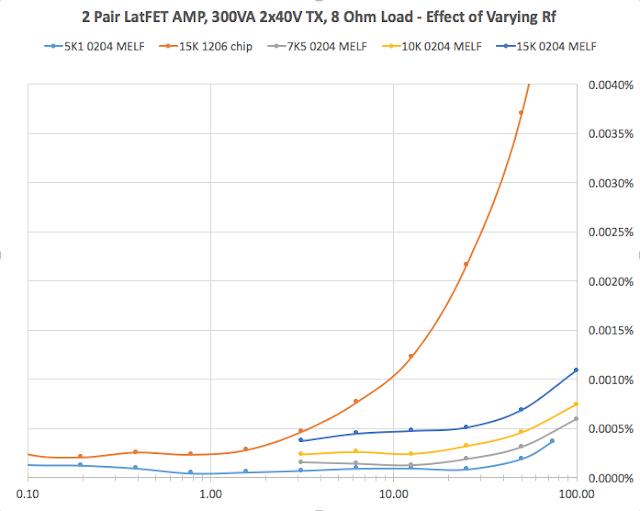 Ideally it'd do 40Vpk-pk at 21 MHz into 50 Ohms, without adding appreciable distortion (the HP3325 is only good for perhaps 0.01% at audio, so that's not a difficult number to reach). 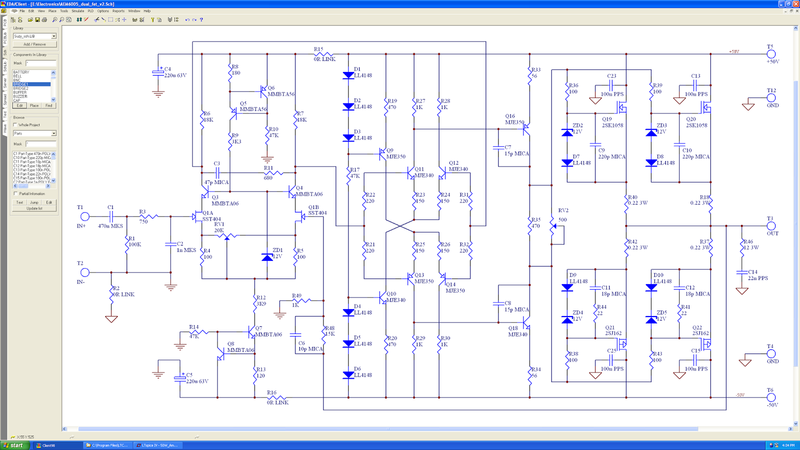 I have an old design for a current-mode headphone amp that I thought might be suitable, so I spruced it up a little, thought in terms of HF rather than audio, and I think I've come reasonably close. At the hard end of the spec it manages 0.08% THD pushing a 1 MHz 40Vpk-pk sine wave into 50 Ohms. Relax any of that and it gets a lot better. For example at 1Vpk-pk, 1MHz, 50 Ohms it does 0.002%. At the "High Voltage option" max spec (500 Ohm load), it manages 0.05%, not a lot different from the 50 Ohm case, due mainly to the heavy feedback current. After gluing the coamings in place, the next step involved trimming them so they were the correct size. This involved a process not-unlike trimming my fringe. Take a little off one side, look at it from afar, take a little off the other side, look at it from a distance, take some more off... Luckily I managed to stop myself before I reached the deck. Then I sanded things smooth, coated with epoxy + filler (this 4mm ply has a pretty crap open-grained face ply, which swallows epoxy), then a couple of coats of unthickened epoxy, then sand down to 180 grit, and finally toplac paint. Here's what it looks like tonight. 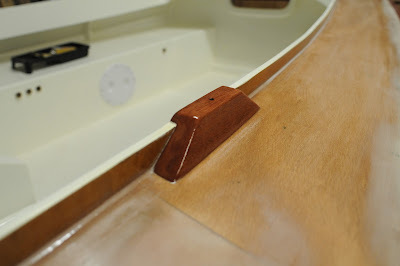 The shaped bit in the bow is to allow clearance so I can flip the forward thwart hatches over. The coaming is about 65mm above the deck at the bow, and 22mm above deck where I'm likely to sit on it. 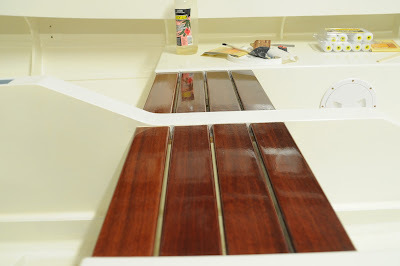 Next job is to complete sanding the decks out to 180 grit and then paint them with top coat. No, I'm not using undercoat. 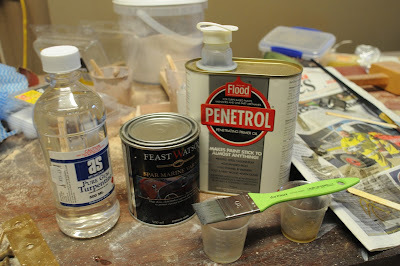 I really dislike the stuff - it clogs emery way too fast for my liking.